In some ways purchasing a piece of software is like marriage – choose the wrong partner and your life will be miserable. In both cases, the discord starts with minor frictions. And before you know it, the inadequacies will become palpable, resulting in a painful end. But as opposed to marriage, it is easier to make the right decision when it comes to selecting a software. All the information about it is available on the internet. You just have to do your research and weigh it up against your requirements. This is particularly relevant for online office suites. Because there is way too much at stake – the expenditure involved, your team’s productivity, and the security of the information you store with them. Most office online suites have different editions tailored to the needs and sizes of organizations. G Suite, one of the most popular suites out there, has three primary editions – Basic, Business, and Enterprise. If you are planning to implement G Suite, you should definitely understand the similarities and differences between the three editions. The similarities make you think if it’s worth paying more for the premium editions. We'll clear up this confusion by analyzing the differences between the three G Suite editions. If you want to pay by the year, you will have to go with the Basic edition – the only edition with an annual billing option. It is priced at $50/license/year. The snag with annual plans is that you can only remove users at the time of renewal of licenses. Moreover, you won’t get any refunds for cancellation during the billing cycle. There are also a few special G Suite editions available – G Suite for Education (Free), G Suite Enterprise for Education ($4/user/month for faculty, staff, and students), and G Suite for nonprofits (it is free, but there is a set of eligibility guidelines your organization needs to pass). Most of you must be accustomed to seeing a progress bar at the end of Gmail inbox indicating the space remaining out of a maximum 15 GB. This is when you are a free Gmail user. It increases when you switch to a paid G Suite edition. The Basic edition users get 30 GB of secure cloud-based storage per user. While Business and Enterprise edition users get unlimited storage. A G Suite storage feature you should definitely keep an eye on — Team Drive. It is a separate storage space for teams. Unlike your regular Google Drive, the files saved on Team Drive belong to the team and not the individuals. You don’t have to worry about data loss when someone leaves your organization. This ‘shared drive’ feature is available only for Business and Enterprise edition users. Vault is Google’s archiving and eDiscovery tool for G Suite. Use it to easily retain, access, track, and manage your domain’s corporate data saved on G Suite products – from Gmail to on-record chats. Outline and implement a data retention policy for your organization. Protect your organization's data from accidental deletions. Place legal holds on certain user's email and chat messages. Easily find and retrieve files, email, and chat messages to meet your organization’s eDiscovery and compliance audit needs. Export your organization's data for additional processing and review. Without Vault, every time a G Suite admin deletes an employee’s account from the Admin console, their data will be lost forever. This tool is available only to Enterprise and Business edition users. Basic edition users are not protected by Vault. They will have to get the license separately. This costs an extra $5/user/month. Lately, we’ve all seen how dangerous information leaks are for businesses. With DLP for Google Drive, G Suite admins can prevent leaks to a great extent. They can set up rules to scan files for sensitive content and assign what actions to be taken if someone tries to share those files with external parties. For instance, an admin can set up a rule to detect files containing credit card numbers and stop external sharing of such files. This feature is only available for Enterprise and Business edition users. BigQuery is a web service that processes large read-only datasets. Now, G Suite Enterprise edition users can analyze their organization’s Gmail logs using BigQuery. Admins can run Gmail log queries to gain insights into employee behavior and activity. Queries could be based on parameters such as subject line, recipient name, marked as spam, emails that triggered a particular rule, and more. Like most other Google products, BigQuery too has a library third-party integrations. These integrations can be used to gain more insights from the data you have. This is a premium G Suite feature and is available only to Enterprise users. Employees tend to spend a lot of time on online suites such as G Suite. Lots of information is passed, exchanged, and stored on G Suite apps. This means it becomes a high-value target for hacking, phishing, malware attacks, and more. As a G Suite admin, it is up to you to keep a track of all the potential security threats. You can monitor this easily with Google’s new Security Center for G Suite. Security dashboard: A central hub from where you can track all the metrics spread across different Google products. You can get an overview of external file sharing and spam/malware targeting your organization. Along with that, you can view metrics that demonstrate your security effectiveness, flag suspicious activity, and more. Security Health: Here you can get a review of the current security settings and also, customized advice/recommendations for potential improvements – on data storage, sharing policies, communications settings, and so on. The Security Center is only available to G Suite Enterprise edition users. 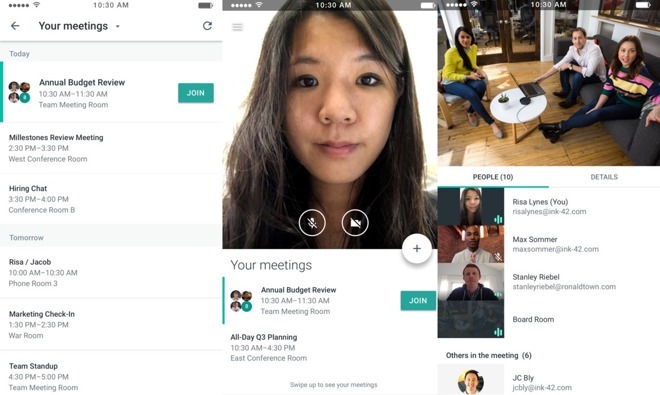 Hangouts Meet is Google’s all new designated video conferencing solution for businesses. It is lightweight, fast, and supports multi-person video calls. However, what makes it stand out is its interoperability — your teammates can join on a call irrespective of the conferencing tool they’re using. Hangouts Meet comes with all the three G Suite editions, with varying capabilities — enterprise users can add up to 50 users (Basic and Business users can only add 25 users), record meetings and save them to Drive, and dial-in from a phone. G Suite has a multitude of services and it isn’t easy to locate the right piece of information when you need it. You could end up spending a lot of time trying to remember things. This is where Cloud Search comes in. Once you authorize it, your teammates can search for content across Gmail, Docs, Calendar, Groups, and their other G Suite services. You can even use the same filters and operators that you use on Google Search. If you have privacy concerns, worry not — your teammates will be able to access only the ones they are allowed to. It is cross-device compatible. All you have to do is visit cloudsearch.google.com. You’d love the mobile app. And that’s not all, it also gives you personalized and actionable information; and recommendations. This feature is called Assist Cards — they will show up on your Cloud Search homepage based on recent activity and upcoming events, such as your scheduled meetings in Google Calendar. Cloud Search is only available to G Suite Enterprise and Business edition users. Now that we have analyzed the differences, let’s look at why you should select a particular G Suite edition. If you are a freelancer, independent professional or small/mid-sized business, then Basic edition is the right one for you. You can create a custom email (no more ‘@gmail.com’). You get 30 GB of storage per account – enough for smaller companies unless you deal with large volume of data. Oh, you certainly receive guaranteed phone and email support from Google. Another point to note is that Basic is the only edition that offers an annual subscription. You can still add licenses as your workforce grows. The Business edition is great for mid-size and growing businesses, especially companies that handle a lot of sensitive information, such as banking, security, or health. Upgrading to the Business edition gives you access to premium features like unlimited Storage, Google Vault (Inboxes, Drive, Chat), Team Drives, and more. If your organization doesn’t deal with large-sized files on a regular basis, then G Suite Business isn't the right choice – you will pay for more features than you actually need. For larger organizations who want advanced functionality like enterprise-grade meetings, security key management, and data loss protection, they should definitely look at the Enterprise edition. Storage, security features, and reporting capabilities– these are the major points of differentiation between the three G Suite editions. Analyze the differences further, evaluate it against your requirements, and decide if additional features are worth the extra cost.